This anthology features dark fantasy/horror stories about vampires, and includes tales from some several of my favorite authors in this genre. 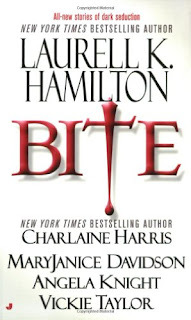 "The Girl Who Was Infatuated with Death" by Laurell K. Hamilton is the opening story, and it features Anita Blake in a story that takes place between the Anita Blake Vampire Hunter series novels Blue Moon and Obsidian Butterfly. It is more of a vignette than a full-fleshed short story - it read like a section that might have been cut from a novel, perhaps because it was not central enough to the story at hand. I enjoyed it because I'm a fan of the series, and it depicts an important phase in Anita's complicated relationship with the vampire Jean-Claude. If I hadn't already been familiar with the characters, though, I don't think I would have connected as well with this one. 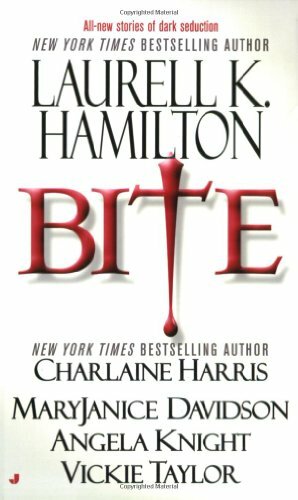 "One Word Answer" by Charlaine Harris is the story I should have read before Definitely Dead, the sixth book in the Southern Vampire series. It explained a few things, most of which I'd figured out by the end of the novel - but even knowing as much as I did, it was still a very effective short story. Sookie finds out her cousin Hadley has died - was murdered. The man who comes to tell her about this works for the vampire Queen of Louisiana, and Sookie begins to realize there is more to the information he's giving her - to the encounter itself - than meets the eye. This one was sharp and surprising, and I enjoyed it quite a bit. "Biting in Plain Sight" by MaryJanice Davidson is set in the world of the Queen Betsy series, and Betsy has a cameo in it, but our heroine is an undead veterinarian named Sophie Torneau. When she suspects a rogue vamp is attacking young girls in a particularly despicable and underhanded way, Sophie decides she must go to the queen for help. A young man who's had a crush on her for years is determined to accompany her, and although he is human and theoretically not much of a match against her undead powers, he has a few surprises up his sleeve. I enjoyed this one very much - it is a sweet and funny story, and honestly it was nice to have a break from Betsy but still be in her world, which is an interesting one. "Galahad" by Angela Knight is a story by an author whose books I haven't read. It opens with a young woman who has been seduced by an immortal to make her come into her powers as a witch, so she can help them fight the powers of darkness. He has dumped her, and all the warriors are off fighting battles, but she suddenly has a vision of such horrors that she knows she must do what she can to prevent it from happening. She partners with an incredibly attractive, charming man who turns out to be the Sir Galahad, and even though she is inexperienced, they make a pretty good team. This grew on my by the end of the story, but the actual premise of the world was just a bit too much to swallow. Perhaps had it been a novel, I might have been more willing to suspend my disbelief, but for such a short work it felt a little too artificial and full of wish-fulfillment to seem truly believable. I did like the humor, though, and the chemistry between the characters. Vicki Taylor's story "Blood Lust" concludes the anthology. I haven't read any of her books, either, so I'm not sure if these characters are from other novels or if this is a stand-alone tale. It is about a young scientist named Daniel, who finds that the project he's been working on - a nonorganic human blood substitute - has been backed by a monster, a vampire who steals his work, not to mention his girlfriend, and leaves him for dead. Daniel survives to plot revenge against the vampire - and his plan is a very devious one that leads to some unexpected consequences. This is a satisfying collection of vampire stories, and fans of any of these authors would be sure to enjoy this anthology. Best Fantasy Stories: "The sometimes light-hearted humor and sometimes suspenseful adventure make this collection of fantasy short stories a delightful and exciting one." Blogcritics: "All in all Bite is a terrific read that I highly recommend to anyone who enjoys fun filled, page turning fantasy." I used to own this, but short stories are just not my thing... Maybe one day I will give it a try, but hard to say! Kailana - I have some issues with short stories, too. If I love the story, I'm always a little disappointed that it ends so soon. I want more!